Just 10 minutes from Prague central station and within walking distance of some of the most exciting tourist attractions of this Czech Republic capital city, the Old Prague Hostel Praha is centrally located making it easy to travel around and even easier to save money. Budget travelers will love this friendly and open atmosphere right in the center of an amazing city. Nearby attractions which are in easy central Prague walking distance are the Old Town Square and renowned astronomical clock, the historic Jewish neighborhood, the famous Wenceslas Square, shopping at Kotva department store and much more. And if what you are looking for is not just a few footsteps away, the B line Underground/Metro and Tram lines 5, 8, 14 certainly are! 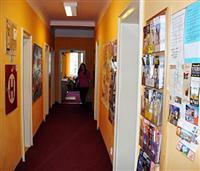 A clean and welcoming atmosphere full of friendly staff and guests make this an ideal low budget Prague hotel alternative. Communal areas, high-speed wireless Internet access and Prague at your doorstep, make this hostel a great place to stay in quality location.